I want more money for mods damnit!! Hopefully soon, i'll be able to get my baby dropped. Everyone else looks good though. Hehe. And get rid of those nasty yellow headlight bulbs. Go get some whiter ones. You have any night pics of the projectors? Looking forward to seeing some of these sedans at the Chicago meet coming up. Hopefully we get more this time. weeeeeeeeeeeeee!!!! dropped my car off at the body shop today to get my front lip and side skirts painted!! after i get the car back it's going to another shop to get my suspension installed! jayF, what kinda camera phone is that? it's pretty damn good! One more of mine. Some of you can see it up close at the Chicago meet! lookin good clean clean clean! BACK FROM THE DEAD! Keep it alive! haha, yeah, lets keep it going!!! i gotta get my camera fixed, and then i'll post some of my car, since i finally got some stuff done to it. alright well here's a few that i took to put on here. it's plain but oh well. That green sedan is looking good! 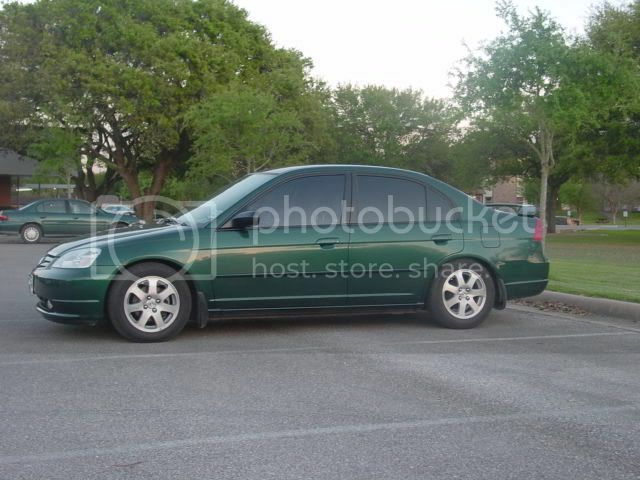 You might want to get the color matched hood and trunk trim instead of chrome--but they would have to be painted at a shop because the 04 civics don't come in that color. Haha. Still going strong after the coupe thread just died. I'm glad I ended up with a sedan instead of coupe.